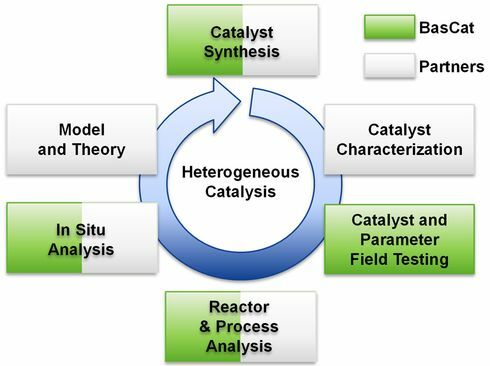 A decisive factor for successfully understanding the complex field of oxidation catalysis on a fundamental level is that we can cover as a collaborative team the whole spectrum of knowledge and experience needed in heterogeneous catalysis research. The research program is currently organized by the following general workflow. The research work will continuously run in the new joint lab BasCat at TU Berlin as well as in partner facilities, e. g. Department of Inorganic Chemistry, Fritz Haber Institute (AC-FHI).